Disney in talks to buy Fox. What could this mean for Alien and Predator? Topic: Disney in talks to buy Fox. What could this mean for Alien and Predator? 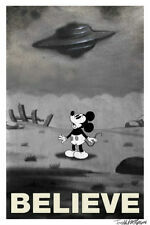 What will Disney do with X-Files? Absolutely nothing. Chris Carter has rammed that series into the ground harder that the Derelict on LV-426. Reboot. New characters. Gravity Falls crossover. The first two movies grossed 1000% of their budget. The rest never grossed more than 3-400%. Disney doesn’t have an incentive to continue the prequels and sequels, especially not with the convoluted continuity involving the engineers (new space jockeys) and drukathi (old space jockeys). Either they will start an alternate timeline from Aliens and declare everything else as Legends-style non-canon, or just reboot everything from scratch to avoid being constrained by old continuity. I hope they will bring Blomkamp and Cameron back to work on Alien V. Sure, it’s definitely pandering to fans and fan theories (especially the concept art of egg-morphing and deformed aliens hooked to alien machines), but letting Ridley Scott go in his own direction didn’t work out so well. Did you know that Ridley originally wanted the alien to kill Ripley on the shuttle and mimic her voice? He needs other people on the team to keep him in check! Forgive me, if this has been posted already but I just got home and haven't had time to go backtreading yet. I just saw this on Twitter. I can't pick which one I want more between the last 2, but perhaps a Covenant continuation merits a film more. Ah, so this is what WATCH was eh? Amanda Ripley TV Series confirmed? I'd much rather have a show that follows Scott around. He just looks at things and either declares them brilliant or total sh#t. "Aluminum foil, it scares the hell out of me. It's f#ckin' brilliant. We've got a fantastic script for it". You don't want to go inside that man's mind. I warn you.